Interest rates have reached historic lows! Interest on a 30 year fixed-rate loan is hanging-tight, right around 4%. As a frame of reference, it was around 18% in the 80’s!! The tax breaks associated with home ownership just keep getting better. Did you know that if your loan is under a million dollars, all your monthly interest is tax deductible? Is your nest egg not as big as you wish it were? No worries! There are more and more programs out there to help buyers put less money down, making it easier to take the plunge. Price negotiations are getting a little simpler too, as stabilizing home prices have leveled the playing field. One more excellent reason to buy is skyrocketing rent. Predictions show that rents will continue to increase nationwide, making it much more logical to put your hard-earned cash toward a solid investment, like a home to call your own. There’s been a lot of talk concerning the lack of inventory in our area and some price points are more challenging than others, but that may be changing. In addition to the usual increase in activity during the spring and summer months, many homes have appreciated in value over the last year which results in more people listing their homes for sale. So that means more choices for you! There are 5.9 percent more houses on the market according to NAR compared to 2015. And if you’re a first time home buyer, there are about to be even more brand new homes for you to choose from. Since the recession, the production of starter homes has been extremely limited. However, according to BUILDER Online, there’s been a 25% rise in the building of entry-level homes for this year. That means there are more homes being built and priced just for first-time buyers. With its beautiful beaches, cultural activities and casual lifestyle, Southeastern North Carolina is definitely a destination location. This region, however, is unique as it owes its durable economy to more than just tourism. The balanced economy and business development in the area are going strong due, in part, to substantial global corporations, healthcare, pharmaceutical and financial industries as well as several institutions of higher learning. Economic growth has consistently remained above the national average while unemployment is significantly lower than both the state and national averages. In addition, the entrepreneurial spirit of this area is evident at every turn. The personal financial site, NerdWallet, conducted a study, which, according to Forbes Magazine, evaluated cities based on “average revenue of local businesses, what percentage can claim paid employees, and the number of businesses per 100 residents.” In addition, “median annual income, housing costs, and unemployment rate were factored in as indicative of the local economic landscape.” Wilmington, which ranked as the second-best city in the nation in which to start a business, has 15 business for every 100 people. From innovative tech start-ups and a wide variety of small businesses to well-known franchises, Southeastern North Carolina is filled with successful entrepreneurs. That’s a sign of a successful region that’s here to stay. 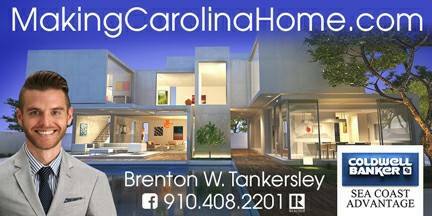 If you’re considering buying a new home, now is the time and Southeastern North Carolina is definitely the place! Give me a call. I'll be happy to answer your questions and walk you through the process.